I got a pleasant surprise a few days ago when Elder Smart came to see me & told me his father had told him to come and see me, I was so excited I hardly knew what to say to him I was so very pleased to see some one who knew you all. I think I have asked every Elder & President who has come to Queensland if they knew you. President Knighton said he knew Ben but he could not tell me much about him. I asked an Elder Robinson to call & see you I gave him all your names but he lived a long way from you so I suppose he would not find time to come & see you, his mother & sisters had a laundry business & I think he helped them when he was home he was a very nice boy & I liked him very much. My daughter Nellie, who is about your age lives near me. She has an only son 17 years of age he started work at the beginning of this year. I was at a Bazaar at the church yesterday I met an old friend of your mother’s a Mrs. Hardman & we were talking about your mother & Martha. Another old friend of your mother’s passed away last week Mrs. Rowly you might know of, her son Andy Rowly is in Salt Lake City. I am glad to tell you Dear Nelly that I joined the church 2 years ago & I have been very happy since then, but please don’t mention it in your letters as I have not told the girls yet. I am hoping you will get this letter by Christmas time & we all wish you all a Merry Christmas & a very Happy New Year & please write to me soon & tell me all about you all. I would like to hear from Ben & Willy I am sure they will remember me a little bit. I hope you will excuse my writing I am very shakey of course you know I am getting old I was 70 on the 24th of last September. Oh well dear Nelly I think I will finish this letter hoping to hear from you soon & I was very pleased you send Elder Smart to see me he is not in Brisbane now he is in a place called Toowoomba about 100 miles from here but he will be back before Christmas & he will come to see me again. Who is Elder Smart? Who is Elder Robinson who’s mother & sisters had a laundry business in Utah somewhere? I did some quick searching to no avail but decided posting more letters was more important than finding these incidental references. Her husband, John Haskins, passed away on 4 Mar 1930 in Annerley, Brisbane City, Queensland Australia. I believe he is buried at South Brisbane Cemetery according to Find A Grave website. “Granddaughter got married in 1937” is in reference to Joyce Gordon, daughter of Charlotte Haskins who married Adam Kennedy. Her daughter, Deirdre, was born in 1938. According to the Australia Electoral Rolls, Joyce was a homemaker (home duties) and Adam a teacher and most of their life they lived on Pauline Street. Willie’s daughter June - Is in reference to William Atkinson, my grandfather Ben’s brother. His daughter was named, June Mary and she was born in 1915. Somewhere here I have photos of her, and I know my dad has a few stories to share. Now, about these old friends of Nellie’s mother, Mary Daisy Atkinson (my great grandmother) - I'd love to know more about Mary and her friends and how she spent her time while living in Australia so I dug around for Mrs. Hardman and Mrs. Rowly or Andy Rowly on Google, Ancestry, FindMyPast and Newspapers.com but only found more questions. I did find a Maggie Herdman who arrived on the same ship as Mary did in 1889, the Jumna, but she arrived in 1890, it’s possible that they were neighbors for a time. Maggie and Mary would have been only a few years apart in age, so perhaps. As to the Rowly, possibly Rowley if it was misspelled, no luck narrowing this down either. Just not enough clues. Toowoomba - what a fun name! I had to run a quick search on Google for “Toowoomba 1938” and the first thing to come up - “Gossip from Toowoomba.” How much fun is that? Out of silly curiosity, I also checked the distance from Brisbane to Toowoomba, 127km. 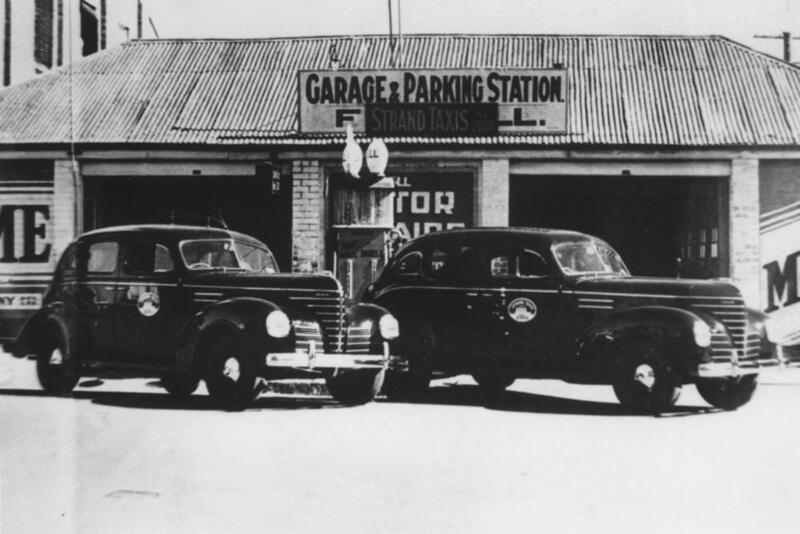 And for just a little more fun, here are two taxis in Toowoomba circa 1938 with absolutely nothing to do with my family. 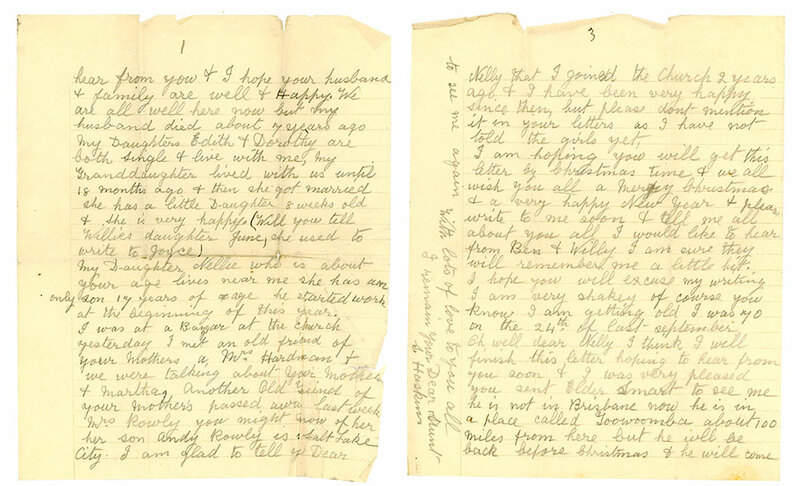 I’d love to spend more time trying to find everyone mentioned in these letters, but I simply need more clues. I’m hoping that in posting all these names here, perhaps someone else will have a few more pieces, maybe a letter or two from any of my ancestors, and then, one day, I can tie all these folks together and discover so much more then their names. Enough distractions. On to the next letter or at the rate I've been going I won't finish this project for twenty years. Happy Hunting!